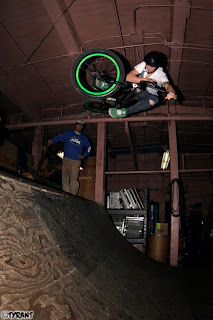 Last night was pretty wild, 6 BMXers and 4 skaters sessioning Jay's ramp. I was pretty impressed by a few of the skaters. It was Tiny TYRANT's first time riding Jay's and of course he has to go off from the get go. His first run included a sweet table, foot jam to vader to drop smith, and a barspin to brakeless tire tap. Dialed! It was a fun session watching dudes feed off one another and just chill and have a good time. No skater vs. biker hostility BS!